If there is one thing that has surprised me the most about blogging, it’s the friends I’ve made along the way. Who would have thought that just by putting my ideas and recipes online that I would end up with a network of inspiring, talented, like-minded people to call my buddies? It’s a welcomed wonder for sure, and an honor to be in the company of so many amazing people every time I turn on my little computer. Sara Forte of Sprouted Kitchen is one of these people. Although we have never met in person, our mutual admiration of one another’s work has been shining for quite some time. Sara is a kitchen genius, making healthy food oh-so appealing with creative combinations of flavours and textures. Some of my favorites from her blog are the Emerald Salad Balsamic Roasted Beets with Spinach Sauce , and Lentil Meatballs in Lemon Pesto. If you’ve been reading My New Roots for a while, I am sure you’ve had the pleasure of visiting her site too – it seems like we roll in the same circle. If you haven’t checked out Sprouted Kitchen, there is no time like the present! Get yourself there immediately. The photography on Sprouted Kitchen is done by Sara’s ridiculously talented husband, Hugh Forte, and of course the two of these people together make magic happen. I always find my mouth watering when gazing at Hugh’s images of Sara’s delectable dishes – they really inspire and dazzle my senses right through the computer screen! Power team! When Sara emailed me with the exciting news of her cookbook launch, I jumped at the chance to review a copy and cook up a recipe to share here on My New Roots. 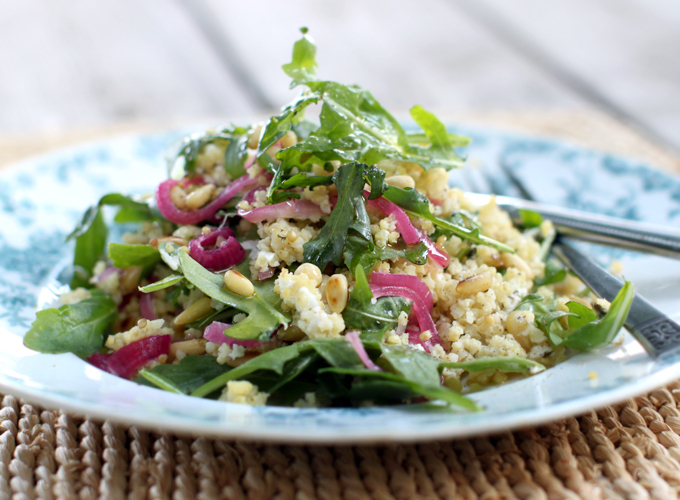 I chose the Toasted Millet Salad with Arugula, Quick Pickled Onions and Goat Cheese, because that is pretty much all of my favorite things in a bowl. Although I was unsure as to how they would all come together, upon taking my first bite I was blown away by the amount of flavour and complexity in the salad – so much more than the sum of its parts. Firstly, toasting the millet adds another layer of taste to the grains that we don’t normally experience. It’s a simple process that takes only four or five minutes, but makes a world of difference. Then you throw in the tangy, vibrant, magenta-hued pickled onions, peppery arugula, salty goat cheese and sweet, toasted pine nuts for a trip to tasty town. This salad has it all. And then some. And then some more. You better see for yourself. Sara’s notes: I prefer a lot of greens in my grain salads (which actually makes them more of a green salad with grain, but bear with me), and millet can go along with just about anything, it cooks quickly, is gluten-free, and is full of magnesium. I like to toast the millet before cooking, and I use slightly less water than you’d typically see suggested elsewhere, to make sure I get individual kernels as opposed to a pot of clumpy grain. The arugula and pickled onions have a kick to them, so they can stand up to the main dish of your choice, like some shrimp skewers or flank steak. This recipe may yield more pickled onions than you’d like to use in your salad, although pickled onions are not as “oniony” as raw red onion, so don’t be shy. Any leftovers will keep in the brine, in the fridge, for about a week. They’re great for tacos or inside a packed veggie sandwich. The millet and onions can be made in advance to save some time. Toss the millet in a bit of oil to keep it from drying out, and keep the onions in a covered glass jar or bowl in the fridge until ready to use. To make the quick pickled onions, in a saucepan, combine the vinegar, salt, sugar, bay leaf, and cloves and bring to a gentle boil over medium high heat until the sugar is dissolved. Add the onion, stir, and remove the pan from the heat. Let the onions cool at room temperature, or transfer it all to a glass jar and put them in the fridge to speed the process along. Put the millet in a heavy saucepan over medium-low heat. Cook, stirring frequently, until the millet is toasted, about 5 minutes. You will begin to smell a toasty aroma and they’ll make a bit of a popping noise. Remove the pan from the heat and carefully add the broth (it will splatter a bit). Return to the heat and bring to a gentle simmer. Cover and cook for 15 minutes. Turn off the heat and let sit another 5 minutes before you remove the lid. Using a fork, break up the millet and ﬂuff it, add the oregano and 1/2 teaspoon salt, stir, and set aside to cool completely. Once the millet is cool, combine it with the arugula in a large bowl. Drizzle the olive oil and vinegar on top and gently toss to coat. Drain the desired amount of pickled onion and add to the salad along with the pine nuts and goat cheese, giving it another toss. Taste and add more salt, if necessary, and serve. I came home from the cottage last night to a not-so-mysterious package waiting for me at the back door (I knew exactly what it was! 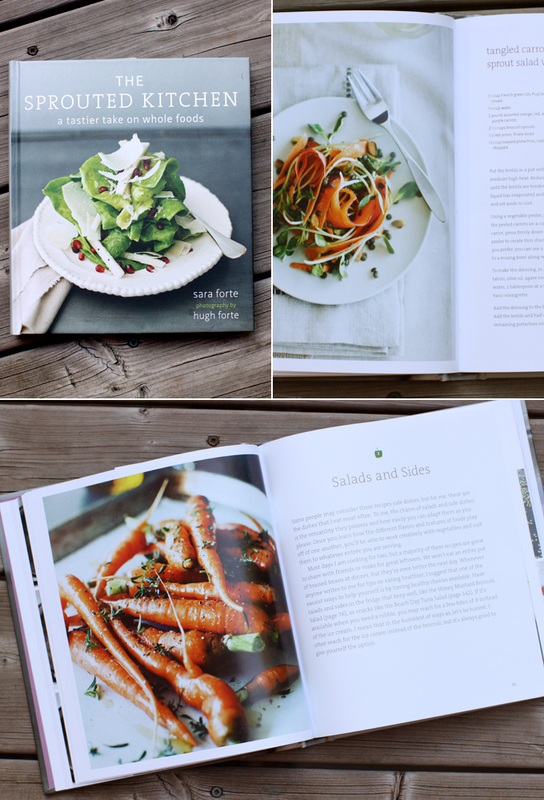 ), The Sprouted Kitchen cookbook. Be still my heart. Inside the cover was a personally handwritten letter from Sara because she really is that rad of a person. And what can I say about this book? It’s beautiful. It’s genuine. It’s everything you want in a cookbook, with the thoughtful, down-to-earth recipes and notions from Sara’s creative heart. If you are someone who wants to be wooed by food and still keep whole foods and seasonality in mind, this book is definitely for you. A big thanks to Sara and Hugh for creating such a honest-to-goodness resource for us all, for when we are feeling inspired, and those days when we just need a little push. The cookbook drops August 28th. It looks like there will be a book tour on the west cost of the U.S., so if you’re in that part of the world, please give Sara and Hugh a high-five from Sarah B, and let them know I look forward to meeting them, someday very soon. You have such a fun way of getting the nutrient info tucked in along with the recipe. You could certainly see your expertise within the work you write. The sector hopes for more passionate writers such as you who are not afraid to say how they believe. Always follow your heart. “Until you walk a mile in another man’s moccasins you can’t imagine the smell.” by Robert Byrne. Nice post. I was checking continuously this blog and I’m impressed! Very useful info particularly the last part 🙂 I care for such info much. I was seeking this certain information for a very long time. Thank you and best of luck. Awesome Video! We in the United states would not have the opportunity to accomplish that, for the reason that law wouldn’t allow the windows being opened, and in some cases should they ended up, our fat asses could never ever suit from them to reach the shutters! Boo-hoo, I would like yet another cheeseburger. Great recipe, thank you! I use millet flour but heard that it is a high GI food. Did you use hulled or unhulled millet? I made this recipe on Sunday and am thrilled with the results! I’m always looking for good ways to use millet. Plus, I discovered pickled red onions a few months back and it was love at first taste. Such a great mixture of wholesome ingredients and unique flavors! I cooked this salad last night and it was beautiful! My whole family enjoyed it. I wasnt sure i would like pickled onions but i loved them. Thanks for the recipe i will definitely be making it again! I didnt have millet so used quinoa, and served the salad with a sides of garlic lemon beans and sweet potato. Made this on Sunday and have had it for every lunch and dinner since. Outstanding! How long do the quick pickled onions keep for? Wow, its very delicious to see this type of foods,all are very colorful also, Thanks for sharing. Looks delicous ! Love your pictures, how colourful, guess it must have been a perfect dinner ! Made this for some guests- used regular balsamic vinegar– my guests LOVED it! MMmmm.. ive been seeing goat cheese everywhere in everything. Time to taste it! made this last night–yum!! we especially loved the pickled onions…do you think i could use the same recipe and make quick pickled okra? We made this today, and it was great. For whatever reason, I happened to buy 3/4 c of millet the other day, having no idea what to do with it… and then your recipe appeared! I used massaged kale instead of arugula and feta instead of regular goat cheese because that’s what I had on hand. Never would have thought to put pickled onions on a salad (or really much of anything non-meat), but they were great. Next question: When are YOU going to release a cookbook? This looks amazing! Love The Sprouted Kitchen. Infact, I pre-ordered their book today and cannot hardly wait! This cookbook looks amazing! Definitely going to pick it up when it comes out. Thanks for the review! I love your recipes. I actually just ate some of your cold lentil salad for lunch:). I wanted to let you know (and invite you) to join a linkup I started for folks to share their Gluten Free Recipes. I just love yours, and would love for other people to get to try them out too! It goes up every Friday. there is so much goodness happening in just this one recipe! blogging is certainly a magical medium for sharing healthy ideas and for building communities. who would have thought? i’ll certainly pick up a copy of this book. and here’s hoping for a My New Roots cookbook in the future as well! Waw, this looks amazingly good! sarah! thank you sweet girl! your photo is incredible, I just love it. I sincerely appreciate the kind words, makes me feel happy. You are admired and adored as well, I’m so grateful for what you do and the ideas your share. Thanks, lovely lady! Looks positively divine! When is this cookbook getting released? how beautiful! i love the quick pickles! must try! I can’t wait to try this recipe tonight. I’m only new to millet, but I’ve read lots of wonderful things about the grain. I look forward to trying to find Sara’s book here in Australia….fingers crossed. I JUST stocked up on millet and you better believe it’s going to be shimmying its way into this salad soon. 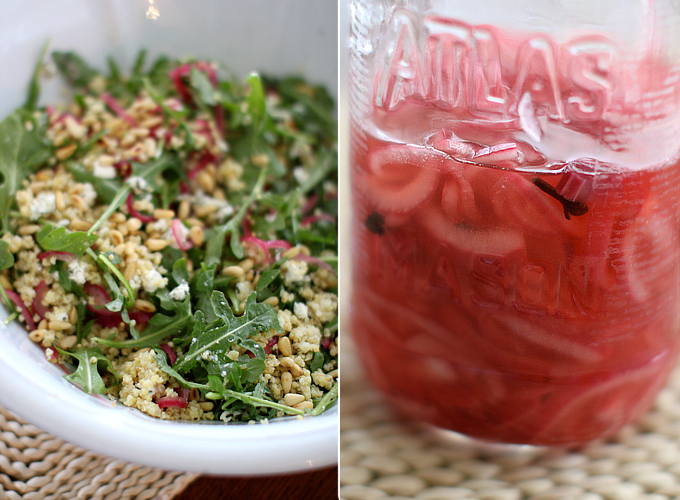 SK is marvelous – and this recipe shows off their sensibility perfectly! Looks incredible as usually! Pickled onions is a great idea, Sarah!